Billowing clouds sweep across the sky in Jan van Goyen's engaging portrayal of the lively waterways near Dordrecht. While sailboats and dinghies filled with men and women come and go, the most active elements of the painting are the shifting patterns of light and shade passing over this watery domain. 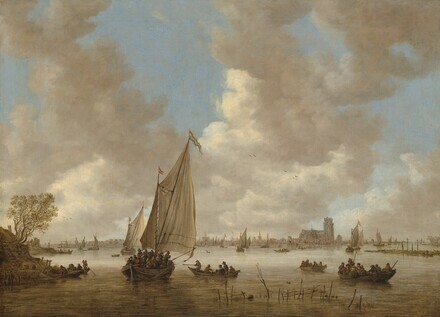 Van Goyen exploited these atmospheric qualities not only through his quick and fluid brushwork, but also in the way he patterned his composition by silhouetting foreground figures and their boats against sunlit waters beyond, and by juxtaposing the distant city profile against the white clouds. While Van Goyen clearly viewed Dordrecht from the banks of the river Merwede, the essence of the painting is not topography but the character of the air and human life in the confluence of rivers surrounding this important and historic Dutch city. Over the course of his long career, Van Goyen painted about 70 views of Dordrecht and its environs. This work, executed in the 1650s, is likely one of the last. The thick and vigorous application of paint is typical of his work from that time, as is the large compositional element of the ferryboat with its billowing sail and the strong contrasts of light and dark. (Sale, Amsterdam, 24 September 1777, no. 43); Vermeulen. (sale, Amsterdam, 11 July 1798, no. 38); Gruyter. Samuel S. Scheikévitch [1842-1908], Moscow and Paris; (sale, Frederik Muller & Cie, Amsterdam, 30 April-2 May 1907, 1st day, no. 82, as Vue de Dordrecht). (Trotti & Co., Paris); half-share sold July 1908 to (M. Knoedler & Co., New York); purchased 22 December 1908 by William Andrews Clark [1839-1925], New York, as Shipping Scene; bequest April 1926 to the Corcoran Gallery of Art, Washington; acquired 2014 by the National Gallery of Art. The early provenance through the 1907 sale is according to Cornelis Hofstede de Groot, Beschreibendes und kritisches Verzeichnis der Werke der hervorragendsten holländischen Maler des XVII. Jahrhunderts, 10 vols., Esslingen and Paris, 1907-1928: 8(1923): 19, no. 50. The buyer’s name is in an annotated catalogue of the 1777 sale in the Frick Art Reference Library, New York; copy in NGA curatorial files. The buyer was possibly Cornelis Vermeulen (1732-1813), a Dordrecht art dealer, painter, illustrator, and copyist. A copy from an annotated catalogue of the 1798 sale is in NGA curatorial files. The buyer was probably Willem Gruyter, Sr., a collector and dealer in Amsterdam. The painting is stock number 11653 in the M. Knoedler & Co. Records, accession number 2012.M.54, Research Library, Getty Research Institute, Los Angeles: Painting Stockbook 5, 1899 April – 1911 December, p. 160; Sales Book 9, 1907 May – 1912 January, p. 90; copies in NGA curatorial files. The Hudson-Fulton Celebration, The Metropolitan Museum of Art, New York, 1909, no. 19 (catalogue entry has the dimensions of no. 18, NGA 2014.136.33). Romance and Reality: Aspects of Landscape Painting. For the Benefit of the Memorial Sloan Kettering Cancer Center, Wildenstein & Co., New York, October 1978, no. 33. The William A. Clark Collection: An exhibition marking the 50th Anniversary of the installation of The Clark Collection at The Corcoran Gallery of Art, Washington, 1978, catalogue without checklist. The William A. Clark Collection: Treasures of a Copper King, Yellowstone Art Center, Billings, Montana; Montana Historical Society, Helena, 1989, unnumbered checklist. Antiquities to Impressionism: The William A. Clark Collection, Corcoran Gallery of Art, Washington, 2001-2002, catalogue without checklist. Hofstede de Groot, Cornelis. A Catalogue Raisonné of the Works of the Most Eminent Dutch Painters of the Seventeenth Century. 8 vols. Translated by Edward G. Hawke. London, 1907-1927: 8(1927): 25-26, no. 50. Hofstede de Groot, Cornelis. Beschreibendes und kritisches Verzeichnis der Werke der hervorragendsten holländischen Maler des XVII. Jahrhunderts. 10 vols. Esslingen and Paris, 1907-1928: 8(1923): 19, no. 50. Valentiner, Wilhelm R. Catalogue of a collection of paintings by Dutch masters of the seventeenth century. The Hudson-Fulton Celebration 1. Exh. cat. Metropolitan Museum of Art, New York, 1909: 20, no. 19, repro. Breck, Joseph. "L'Art hollandais à l'exposition Hudson-Fulton à New-York." L'Art Flamand et Hollandais 13 (June-July 1910): 59. Valentiner, Wilhelm R. Catalogue of a Loan Exhibition of Paintings by Old Dutch Masters Held at the Metropolitan Museum of Art in Connection with the Hudson-Fulton Celebration. New York, 1910: 86, no. 19, repro. Carroll, Dana H. Catalogue of Objects of Fine Art and Other Properties at the Home of William Andrews Clark, 962 Fifth Avenue. Part I. Unpublished manuscript, n.d. (1925): 132, no. 71. Volhard, Hans. Die Grundtypen der Landschaftsbilder Jan van Goyens und ihre Entwiklung. Frankfurt am Main, 1927: 163, 188. Corcoran Gallery of Art. Illustrated Handbook of the W. A. Clark Collection. Washington, 1928: 42. Corcoran Gallery of Art. Illustrated Handbook of the W. A. Clark Collection. Washington, 1932: 47. Breckenridge, James. D. A Handbook of Dutch and Flemish Paintings in the William Andrews Clark Collection. Washington, 1955: 20, repro. Beck, Hans-Ulrich. Jan van Goyen, 1596-1656: ein Oeuvreverzeichnis. 4 vols. Vol. 2: Katalog der Gemälde. Amsterdam, 1973: 2: 153, no. 311, repro. Sutton, Denys. Romance and Reality: Aspects of Landscape Painting. For the Benefit of the Memorial Sloan Kettering Cancer Center. Exh. cat. New York, Wildenstein & Co. New York, 1978: 18-19, nos. 21 and 33, repro. Sutton, Peter C. A Guide to Dutch Art in America. Washington and Grand Rapids, 1986: 299. Lewis, Hall, ed. The William A. Clark Collection: Treasures of a Copper King. Exh. cat. Billings, Yellowstone Art Center, Billings; Helena, Montana Historical Society, Helena. Billings, 1989: 7, 42, repro.